In April of 1959, just a few months after they'd taken control of Cuba, Fidel Castro and his younger brother Raul met at a Houston hotel for a showdown. Fidel was touring the U.S. to win support for his revolution; but Raul, according to the book After Fidel by former CIA analyst Brian Latell, insisted they ditch the gringos and accelerate plans to make Cuba a communist island. The argument got so loud and heated in their suite that aides in adjoining rooms couldn't sleep. The next morning, however, the brothers emerged as chummy as ever  and went on, of course, to communize Cuba. Almost 50 years later, the Castros appear to be hashing out their differences in print instead of hotel rooms  and this time it's Fidel who's arguing from the left. The 81-year-old comandante has made a new career of sorts as an op-ed scribe since he resigned as Cuba's President earlier this year because of health problems, leaving Raul to become the government's new No. 1 two months ago. Since then, Raul, 76, has ordered a series of small but significant economic reforms, from letting Cubans own cell phones to allowing farmers to till their own land  ideas that Fidel doesn't always find communist kosher. In a brief article published this week in the government mouthpiece Granma, Fidel takes issue with the idea, posited recently by a Cuban columnist in another official newspaper, that Raul's changes are progress compared to the more restrictive and collectivist ways of the past. In the not-so-subtle style Fidel is known for, the article's headline reads: "Don't make concessions to enemy ideology." The essay  which warns Cubans to "meditate hard" on the policy changes and avoid "shameful concessions"  is the latest step in a strange sibling dance. Though long considered a hard-line communist, whose enemies accuse him of overseeing summary executions of soldiers loyal to former right-wing Cuban dictator Fulgencio Batista in the revolution's early days, Raul is considerably more pragmatic than the obdurately ideological Fidel. His encouragement of limited market-oriented policies like foreign investment in tourism helped see Cuba through its frightening "special period" after the island's lavish Soviet aid vanished in the 1990s. Now that he's in power, Raul is pushing further economic liberalization and improved ties with the U.S. (Washington has maintained a trade embargo against Cuba since 1962). But, because he lacks the charisma that helped keep his brother in power so long, Raul also has to keep the legendary Fidelista flame at least half lit. Even as he pledged at his inauguration to make Cuba "more efficient" and to "start removing" its "excess of prohibitions," he declared Fidel "irreplaceable" and insisted he would "continue consulting" his bearded brother on policy decisions. 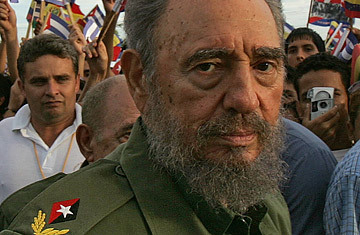 As a result, Fidel's contrary op-eds are part "of an extremely delicate balance" Raul is pursuing in the early stages of his presidency, or at least until Fidel dies, says Dan Erikson, senior associate at the Inter-American Dialogue in Washington, D.C. "Does he disappoint Fidel or does he disappoint the Cuban people? The reality is that the legitimacy of his government rests on pleasing Cubans but not straying too far from Fidel." Analysts like Erikson concede that Raul's reforms, including permission to let Cubans buy electronics in dollar stores and gain title to their own homes, are "marginal" so far. But "for ordinary Cubans it's been a lot of change very quickly," he says. To keep their reform expectations realistic  and to appease diehard Fidelistas in the government  Raul has to indulge "Fidel's new habit of undercutting him at various times," says Erikson. Fidel's armchair governing also appeals to an important overseas constituency  Chavistas, the loyalists of left-wing Venezuelan President Hugo Chavez, who reveres Fidel for his socialist purity and anti-U.S. ferocity. The relationship between Raul and Chavez is cordial at best; and Chavistas make no secret of their displeasure with Raul's quasi-capitalist bent. But Raul can't afford to alienate Chavez, who controls the hemisphere's largest oil reserves  and who each day sends 100,000 barrels of cut-rate crude to Cuba that has helped keep the island's economy afloat this decade. Raul is widely expected to announce deeper changes during a speech on May 1, which is Labor Day for much of the world and a sacred date on the communist calendar. Since greater agricultural efficiency is regarded as his priority, some analysts say he might permit foreign investment in that sector as well. He may also allow Cubans to travel abroad freely and open the door to wider entrepreneurship in Cuba, letting business owners hire employees other than immediate family members and set their own prices. Even so, Cuban officials are warning people both inside and outside of Cuba not to expect a free-market economy on the island any time soon. And while Raul has encouraged debate about Cuba's socialist system, most analysts agree that he's pursuing a China-style model that opens Cuba's economy but does not liberalize Havana's stringent politics. Perhaps he knows that if he attempted the latter, he'd have to read even harsher op-eds by his brother.